Utilities worldwide are adopting smart technologies, including smart metering. MosChip’s MonitorMyMeter Smart Metering Solution is engineered to monitor energy and water meters for industrial, commercial, and residential metering applications. The manual process is automated, and the frequency of the data collected requires less time which allows for the detection of the demand generation, and demand profiling 24/7. MosChip’s Smart Metering Solution is an end-to-end solution that replaces the analog meters to smart meters. Our Smart Metering Solution measures the amount of water and energy used in a single console. With our Smart Metering Solution, businesses can monitor the power quality, access and report critical information, maximize grid efficiency, and perform real-time instrumentation. MosChip’s MonitorMyMeter Solution for smart metering is an indigenous end-to-end solution that converts your existing meters to smart meters without any changes to hardware or protocol of your existing meters, and no additional cost of wiring or maintenance. The smart meters collect data through an integrated wireless module and the data collected is uploaded to a cloud application and can be remotely monitored to make informed decisions by businesses/utilities. With our Smart Meter Solution utilities/businesses can get data like I/O voltage, I/O current, consumption patterns, velocity, pressure etc. Smart metering solution for energy/ water consumption and flow measurement. Solution based on MosChip’s WiART series of low power radio frequency solution. Wireless solution with higher area coverage. Remote monitoring via cloud-based application. Alerts and alarms for consumption or deviation. Lower installation and operational cost. More than 200 meters in one network require one GPRS connection. Centralized analysis of energy/water consumption over the cloud. Export of data in CSV format for ease of billing. Support for mobiles and smart phones. MosChip’s Smart Metering Solution helps you remotely monitor meters (water & electricity) with real-time tracking to track the energy consumption patterns, trends, and misuse. Make informed business decisions with daily, weekly, monthly reports on energy/water consumption. Our smart metering solution helps utilities/businesses reduce their operational & maintenance cost and have optimum utilization of resources. MosChip’s Smart Metering Solution enables businesses/utilities manage hundreds of meters (water and electricity) from a single dashboard. The solution helps to monitor & control the meters from a centralized location. We have our own wireless modules that are used to transfer data wirelessly. The module is integrated with existing meter with no change to hardware and protocol. Data collection procedures include Data Concentrator Units and Hand-Held Units, depending upon your choice. We provide an end-to-end solution for smart metering. Receive hourly, daily, weekly or monthly reports on usage status, consumption patterns. The users can export the data for billing & survey load. The advanced reporting module helps the users to access reports of sites, regions, etc. The dashboard shows data such as load, downtime, consumption, critical issues etc. Using MosChip’s Smart Metering solution utilities can proactively monitor the meters, power lines for any uncertainties and prevent down-times. With our solution, get alerts as and when the maintenance is required and prevent unplanned reactive maintenance which is costly. Using our solution, utilities can reduce OPEX cost, improve the equipment reliability, reduce down-times and minimize the maintenance time. With our solution remotely manage smart meters at various locations on a single dashboard. Access smart meters site-wise, region wise on a digital map. With our Mobile App, track & monitor the electricity/water/gas meters from any location. With the help of our smart metering solution, keep a track on the vital parameters and act as and when required which reduces down-time & uncertainties. Manage your smart meters on the go with MosChip’s Smart Meter Solution. In case of any uncertainty like excess consumption, loss due to theft or breakage of pipes or lines, high water pressure, equipment faults, over heating or any other critical issue that disrupts the operations of a business or a utility, MosChip’s Smart Metering Solution sends an instant notification/alert to the user via SMS/Email to the operators & technicians. This helps the operators to take immediate actions and restore to normal functionality of the business/utility. Different escalations can be configured based on the issues in the solution. The user-friendly portal allows to remotely manage hundreds of meters (water/electricity) from anywhere. The dashboard provides access to various reports on energy consumption, patters, pressure, I/O current, I/O voltage, pressure, alerts if any on a single dashboard keeping the user informed. The data from the dashboard helps the utilities & businesses with actionable insights to make better business decisions. MosChip’s MonitorMyMeter Smart Metering solution is a comprehensive solution with hardware, software and sensors. Our solution has been integrated with various with multiple meters as per the global standards. Field survey tools – android, google map mapping tools. 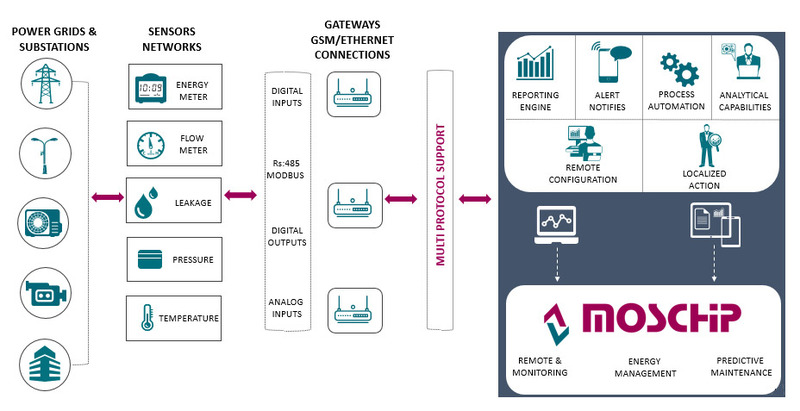 Network diagnostic and analysis tools to determine signal strength, topology – mobile. Web and desktop-based configuration utilities.